series description This series consists of 16 ōban size prints. image description Woman who holds a long pipe in her hands looks down to a gift basket which is standing beside her feet with a fish inside. The Gaman sonja on the hanging scroll is holding an ash receptacle made of bamboo in his hand and from the ascending smoke a dragon is rising. 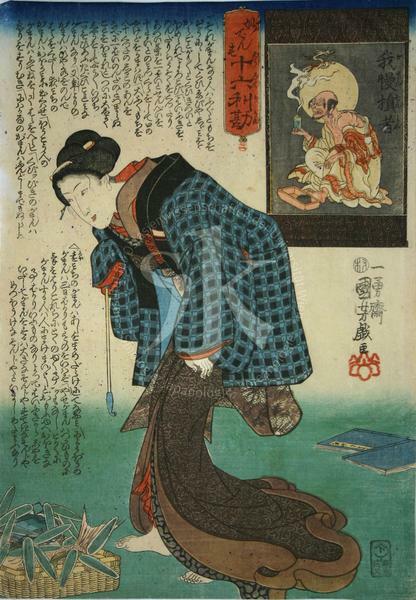 interpretation After the edict (machibure) from the 6th month of 1842 which interdicted the bijinga (beauty-pictures), Kuniyoshi started to paint this type of pictures as giga (humorous pictures) in order to bypass the monitoring system of the authorities. The „16 illustrations of Arhat (十六羅漢 16 rakan) became “16 considerations of profit” (十六利勘 16 rikan), the “Buddhist saints” (尊者 sonja) became “damaged saints” (損者 sonja). Kuniyoshi produced in this series a very simple and straight logic about different characters of persons of that time, and presented them in a funny and cynical way. In this series of 16teen pictures two different types of censorship seal can be observed. Ten pictures are signed with “Murata”, six with “Mura”. In any case it indicates the person in charge for the censorship system, Murata Sahē. The researcher Iwakiri assumes, that the censor Sahē changed the seal from “Mura” two “Murata” during the printing of this series in the 10th month of 1846. The Japanese proverb “Dragon out of the ash receptacle” has the same meaning as “A pony out of a gourd” namely, that something totally unpredictable is happening. The meaning of Kuniyoshi’s picture is something different. He tells the “saint damaged by endurance” deadly serious, that it is quiet uncomfortable for a dragon to endure in such a small place as an ash receptacle. At the notes on the picture all different kinds of endurances are listed, such as the “endurance of the aged”, the “endurance of the road at night”, the “endurance of the servants”, the “endurance of the neck-pulling-game”, the “endurance at a pelting rain”, the “endurance at a long path”, the “endurance of the wife” or the “endurance when you do not want to show that you can not endure any longer”. All these different kind of endurances are of no use at all but are harmful and that is why we are told never to endure. Kuniyoshi presents the fundamental idea of the Tenpō-reform through the Confucian doctrine “endurance means to endure the unendurable” in a clear and cynical way.